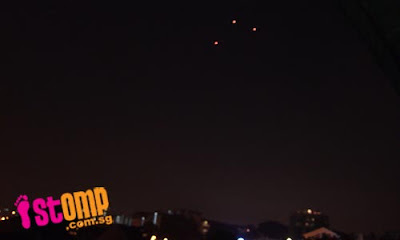 Did anyone else see that triangle Ufo over singapore recently? "I was smoking at my home kitchen window around 11pm at Upper Paya Lebar and happened to see 3 shimmering lights in the sky, moving slowly in a uniform triangular pattern. Poster comments: This video was taken at around 10:20pm. excuse the video quality since this was taken on my mobile phone. the thing that struck me about this is that the three orange/red lights was initially in a perfect triangle, then it started to change shape. I highly doubt that these were commercial/millitary aircrafts since I've seen lots of them fly by before and they're usually easily recognised as low-flying, fast moving, and you can see white lights at the bottom of the aircrafts accompanied by blinking red lights. But in this case, the lights were PURE ORANGE/RED solid lights. i was waiting for someone to pose smth like this. unlike u i didnt see three lights. i saw one﻿ bringht orange orb at about 9pm in central area. it was glowing bringht orange, but larger and more luminous than any airplane lights, no flashes,﻿ just a solid somewhat hazy glow, as if it was made of flames. it appeared to be stationary for a few moments, then moved a little (which in actual fact is quite a vast distance judging﻿ fromhow high it was) then it﻿ went stationary again,then moved again. did that about 3 times. an airplane or helicopter has more of a constant rate of movement and linear path of flight, it was kinda exhibiting hovering movements. Why the Triangle Shape or patton? ?...Rumours are, that it may be a military Kite!...A Kite! ?...Well there yu go! ?..It must be the string theory! lol.. A little bit Remote!? Hey.. i got these pictures taken from Malaysian border facing Singapore. it was taken on 29th of October 2010 around 8 to 10 PM which clearly shows a bright 3 lights in a triangular formation changing colors from red to blue then to white~orange. I know its not starts coz one of it moves left to right. The picture was taken using a Canon cam where it was set to prolong the light exposure. (i dunno what the setting is. i'm not a pro) Contact me for the pics. Just saw this in Philadelphia, but three bright white lights. They were all aligned the same way as in the video.. Saw the same on December 24th in USA..